A PSA: Vulnerability is our greatest strength. Social media is a miracle. I meet new friends and stay connected with old ones. I can keep my finger on the pulse of inspiration in our world. There are pictures of puppies and foals and yes, those people who knit for their chickens. So much community to love. But this week Facebook has sucked the life out of me. Maybe your page looks like mine lately: Emaciated cats with snotty eyes. Old horses at kill lots. Mustangs being chased to death by helicopters. A photo of the second corgi recently, shot to death by some jerk who thinks his right to bear arms includes shooting a neighbor’s dog in their own yard. And then we are still reeling from the Black Forest Horse Abuse case, the number is up to 17 dead and decomposed on the ground. There was a golden moment that a lot of us stood up, joined voices, and the equine survivors got help. We felt powerful -we were heard and things happened. Then before I caught my breath, it seemed that another 200 desperate stories screamed for my attention. Sometimes I had to discipline myself to not look at the photos. 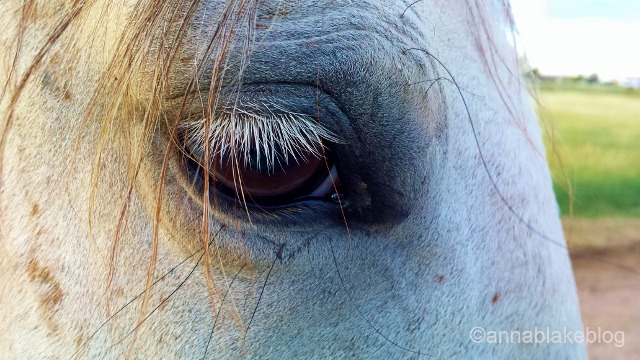 The hard part of being a 60-year-old horse-crazy girl is staying positive. There is a name for this feeling of tired overwhelm: Compassion Fatigue. It is commonly thought of in terms of human care givers and health care workers, but this week I read a great blog (link here) about the same stress in the animal welfare community. High time. Compassion Fatigue symptoms include depression that sometimes leads to suicide. Is that serious enough? The world lost a wonderful veterinarian and animal advocate this week. Dr. Sonja Yin is mourned by everyone who believes in force-free training. And October is National Depression Awareness Month. Disclaimer: I have it easy. I don’t work full-time in the front lines of rescue. I’m not a vet or a vet tech. I’m lucky; I get inspired by my clients trying to help their horses and I have a good friend who listens when I need to rant. Not to mention Edgar Rice Burro routinely lays his head on my chest to check my blood pressure. I repeat, I have it easy. Maybe this Facebook Flu I feel sometimes is a lesser relative of Compassion Fatigue, it’s more like Compassion Whininess. Do you get it, too? It’s a slap on the wrist for being aware of the plight of PMU foals or the media stereotyping of some dog breeds, like aversion therapy for caring. Maybe we should develop a kind of soft spot for depression, too. Chronic or situational, depression needs our attention and concern as well, if we are going to keep giving our attention to animal welfare issues. We need to take care of ourselves so that we can take care of the animals that need us. And who better than us not-quite Compassion Fatigue-ers to encourage and support the animal welfare workers? We understand a small corner of it. It is always in our periphery. Have you thanked your veterinarian lately? I have had too many midnight, ground blizzard emergency calls to even pretend there is any romance in that occupation. Sometimes the front desk calls to tell me my vet will be late because of an emergency call. I behave especially graciously, however inconvenienced I am. I know others are dealing with bigger challenges than getting spring shots. Being patient is like investing in future karma. The only animal welfare work more stressful that the veterinarian’s might be rescue work. They get lots of late night calls threatening to ‘put down’ an animal if it isn’t immediately picked up. It’s almost like a ransom call with a death threat. Then there is the daily work to mend broken animals while wading through the sludge of humankind, and the cherry on top is having to keep an eye on the budget and often ask the public for money. This is, of course, the same public whose Facebook page looks as grizzly as mine. This is what is easy to forget… this is the most important thing: We all need to stay vulnerable. We need to keep prying our bruised hearts open. We can’t turn into those people who page by pleas for help to get the posts on horoscopes and celebrity gossip. Our vulnerability is our greatest strength. It is the part of us that makes us good riders and kind friends and strong advocates for animals who can not speak for themselves. We have to protect the compassionate part of us. So when I was feeling a bit heart-sore last week, I took my own advice. I went for a massage. It was wonderful; she worked the starving horses out of my tight shoulders, she loosened my calf and thigh muscles that have held my stand against animal suffering. I felt nurtured and restored. Leaving, I stopped at the end of the driveway and saw three horses galloping down the road towards a busy street. In a blink, a woman in flip-flops with a grain bag and a handful of halters leaped into my truck and we were off in pursuit. Predictably, I reminded the woman to breathe. By the time we caught them, with the help of other random horsepeople, I was late to my next lesson. No worries though, my clients hope for the same help when they need it. We are good people who care about animals. With a special wish for peace and healing for all the committed animal welfare workers around the world: Ask for help when you need it, take good care of your soft heart, and know we have your back. Most of all, thank you. That means you watched him do this hard job, so you get our thanks as well. So grateful for vets and the miserable hours they keep. Dear Anna, Your blog really hit home for me; I think you are exactly right. As a retired veterinarian and now Episcopal priest, I have had to learn over many years to take care of myself because if I don’t, I have nothing left to care for others. , I think clinical depression and compassion fatigue are signs of pain that our body/mind/spirit sends us as a SOS call. It tells us we need to slow down, pay attention, and allow ourselves to truly feel all our feelings of sadness, grief, anger, fear, or …..Writing, talking with friends who truly listen, massages, a cuddle with a beloved pet, a walk or ride somewhere beautiful all can be restorative. My personal favorite is a cuddle with my two papillions on my lap. Thank you for your blog. The best things about Fridays: It’s Friday (of course), and I get to have my coffee and weekly Anna Blake fix. By now I have learned to have a Kleenex ready for the tears that inevitably issue forth. Bless you, dear, for touching my heart and nudging my brain, and most of all for always getting it exactly right. Hey Mary….great to hear from you! Just a quickie here – I’ll answer your post properly later. Very well said. I find I cannot look at many of the horrific scenes meant to shock us all into action…but when the world is overwhelming enough and you take care of your own animals to the hilt, watching a grotesque, gruesome scene for me is not going to accomplish anything for those unfortunate abusive cases or situations, I have learned in dealing with other traumatic events baby steps are sometimes called for and at times at least a move forward. Love your articles…I think Kim Walnes shared one to one of the dressage groups. I agree, the blood and guts shot makes me shut down. I know a woman who fights for mustangs with photography showing their beauty. Carol Walker at http://www.livingimagescjw.com/ I love her commitment and her approach through art. Thanks for reading, and you are right. Baby steps. I agree with you Anna, that if we look after what we CAN do something about, then the world is a better place. And you only have to look around at the explosion of good horse stuff to be heartened that the world IS changing. Carers and nurturers of all descriptions, whether they work in human or animal health and rescue are at risk of burn out because we aren’t taught how to understand our connection to others. In my experience, it is possible to understand our feelings in such a way as to strengthen us and make us more effective, instead of burn us out. I love your writing and am pleased that you don’t stay in the barn and muck all day. Me too – I wish I had managed to express it more like that! Burnout is a pretty interesting topic. Through the course of my life I have had to learn how to not get bucked off my passions…had to learn how to live with them and not get destroyed by them. There are some good mentors out there. You post came at a particularly needed moment. As a veterinarian who is exhausted emotionally and physically, I can’t say enough how much your kind words mean. I wish I could say no to the staving dog that I found in the road on my way to work, or to the 10 year old never-been-haltered mare that was abandoned at my clinic. Instead they have been added to my herd and pocketbook and I will do the best I can for them. Gratitude is the fuel in my tank and I have been running on empty these last few months. While I am not you vet, I say “Thank you”. Anna, please delete this if you think that this is inappropriate. Kelly I thought twice about replying, because this is not my blog and I do not know what services Anna offers – she certainly writes brilliantly and has much compassion – but like your picking up the dog and the mare, I cannot let the vet/human version of that pass without offering a hand. 🙂 My area of expertise is burn out in the caring professions. It’s always the best people, the ones that we need the most – and, paradoxically, the strongest, that experience this stuff, The solution is simple, practical, eye opening and doesn’t take long either. It would be my privilege if you would reach out. Email Anna and she will give you my email address. DR. Kelleyerin- I want to say thank you some more. Because there is a commitment involved in taking animals in, and another commitment involved in driving by…If it is a challenge for us civilians to keep open hearts on Facebook… you are fighting on the front lines, at great personal expense. You are my hero and I believe in karma. Things always come around. But then I sometimes see things backwards–The (un-rideable) mare that I took in so she could escape the killers turned into the one in the herd that nurtured me the most. I am thinking those ‘strays’ of yours might end up having a present for you. I’m so glad that this has a name and that other people suffer from it also. It kills me to hear and see so much cruelty and neglect in this world and I am losing faith in humanity because of it. It makes me not want to be living on this planet. When I hear or see about animal abuse or neglect I want to go jump off of a bridge because I can’t do anything about it! But I know I must go on and care for my own precious animals because no one else will. I think for alot of us, the only immediate peace is to take good care of our own… and beyond that, we can all work on changing laws. But you are right, the ones we can’t reach, are heartbreaking. Thanks for this comment. Love your heart and encouragement, humanity and understanding and respect. I didn’t know that there was a name for it, compassion fatigue, thanks for being there and seeing what’s happening and putting it into words so we can understand it. RIP. Dr Sonja Yin her work and love live on. Kelleyerin Clabaugh, DVM thank you from all the animals you have cared for and for being honest. We support you and think you are amazing. Go treat yourself to a nice massage!